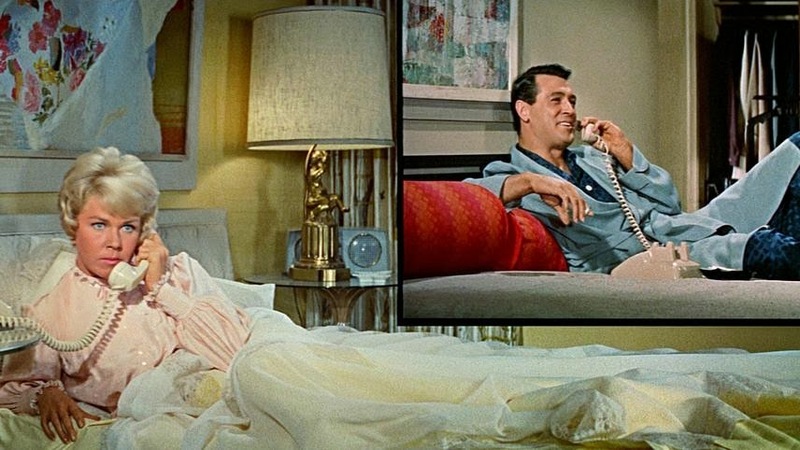 A stylish romantic comedy, Pillow Talk combines romance, laughs and some prescient social commentary. 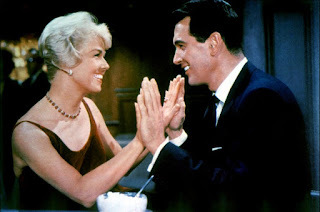 In New York City, a shortage of phone lines means that songwriter and womanizer Brad Allen (Rock Hudson) shares a party line with interior designer Jan Morrow (Doris Day). Both are single and live alone, but Brad spends an inordinate amount of time on the phone romancing a succession of women, interfering with Jan's ability to run her business. Without meeting in person they clash frequently over the phone as Jan tries to put some limits on how often Brad uses the line. Jan is being romantically pursued by wealthy businessman Jonathan Forbes (Tony Randall), who also happens to be bankrolling a new Broadway show with tunes being written by his friend Brad. It's not long before Brad deduces that Jonathan's potential girlfriend is his phone nemesis. After a chance encounter at a restaurant Brad takes on the persona of Rex Stetson, a wealthy Texas businessman, and starts a long and passionate pursuit of Jan. She falls in love with Rex, while all the time receiving advice and warnings over the phone from Brad, who seems to have an uncanny ability to predict Rex's every romantic move. With the affair between Rex and Jan turning serious and Jonathan beginning to suspect that something strange is going on, Brad realizes that creating a real relationship out of an elaborate ruse will not be easy. Directed by Michael Gordon, Pillow Talk is a jaunty romance, with two strong characters clashing, connecting under false pretenses, and then navigating their way to a resolution. The 98 minutes are packed with a healthy amount of romantic incidents contrived to bring Brad and Jan together via the most convoluted yet entertaining path possible, and the film maintains a brisk pace and a colourful, dynamic aesthetic. Stylistically, the film also takes a modern turn. Gordon makes frequent use of split screens, and finds clever arrangements to enhance the romantic elements with a sexual charge. Day and Hudson (as Rex) in separate bathtubs but with their raised feet connected at the split screen seam is a classic shot, ushering in a new, less inhibited world that would soon take over screen romances. This was the first of three collaborations between Hudson and Day, and they quickly establish an easy chemistry that mixes fireworks, charm and seductiveness. Tony Randall and Thelma Ritter (as Jan's perpetually hung-over housekeeper) provide the support, with Ritter suffering somewhat from an underwritten role that leans too heavily on her pre-established persona. Pillow Talk is comfortably fluffy on the outside and stuffed with pleasingly risque feathers.